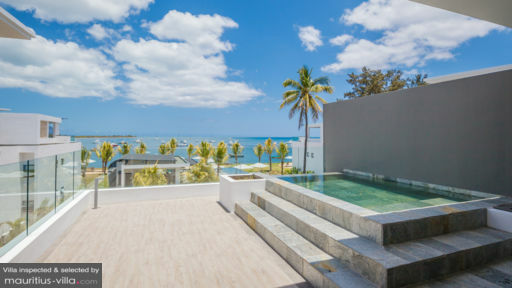 Located in Black River, one of the most elegant districts of the island, Latitude Penthouse is perfect for families and groups who wish to book a luxury villa in Mauritius. Boasting spectacular views of the glistening azure ocean, this villa offers plenty of perks and amenities to enhance your stay in Paradise Island. 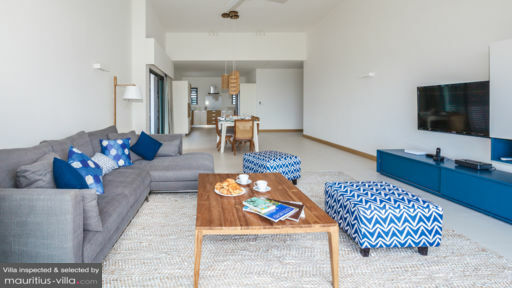 Located on the sunny South-Western coast of Mauritius, the villa is beautifully-furnished to feel just like home. Latitude Penthouse offers three spacious bedrooms to very comfortably accommodate your relatives and friends. The master bedroom features a spa-like en-suite bathroom as well as a king-sized bed. In the first guest bedroom, you’ll find two twin beds, while the third one sports a queen-sized bed. Because the master suite overlooks the lagoon, you’ll be able to wake up to spectacular sunrises every morning. Latitude Penthouse is nestled in a massive emerald green garden which is designed in such a way so as to let in plenty of natural sunlight. 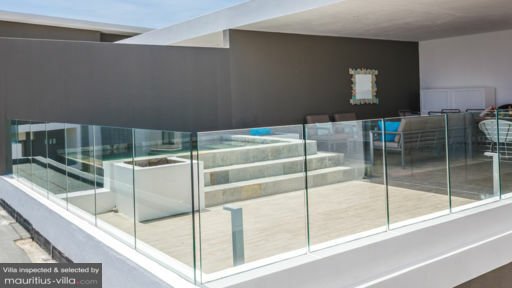 Facing the ocean, the grounds also offers sun loungers and barbecue facilities. There’s also a massive shared pool, perfect for a refreshing dip after a long day of touring Mauritius. This penthouse boasts a spacious living area with a flat-screen television and a comfortable couch where you can spread out and relax on those lazy afternoons indoors. There’s also a flat-screen television with satellite English and French channels. A dining room adds extra space where you can gather and relax over delicious dishes and good conversation in the evening. Because Latitude Penthouse is self-catering, there’s also a perfectly equipped kitchen with an oven, dishwasher and everything else you’ll need to prepare your meals. Be assured that all the living quarters are fully air-conditioned to shelter you from the tropical heat. As a guest of Latitude Penthouse, rest assured that you’ll be pampered with plenty of services to render your stay even more enjoyable. For example, you will receive the daily visits of a housekeeper who will tend to the penthouse, ensuring that you always have a pristine environment to live in. Upon request and for an extra fee, an in-house chef will also show up to prepare local and international delicacies for you. As a guest of the villa, you can even benefit from various concierge services to arrange for excursions, restaurant reservations and various types of activities around the island. For an extra fee, you’ll also receive a daily breakfast delivery as well as a welcome pack full of tea, coffee, butter, yoghurt, cereals, jam, bread, beer, fruit juice, coconut water and more. Because there is so much to do and explore around the villa, you can be sure that you’ll never run out of things to do. For instance, a short drive away is the UNESCO World-Heritage site, the Morne Brabant Mountain, which is brimming with Mauritian history. Climb to the very top and you’ll actually be able to spot the optical illusion of an underwater cascade which made headlines all around the world. Not far from the villa is found the popular Cascavelle Mall which is particularly reputed for its extended variety of restaurants, boutiques and supermarkets.